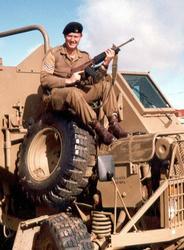 The Eland is an air portable light armoured car based on the Panhard AML. 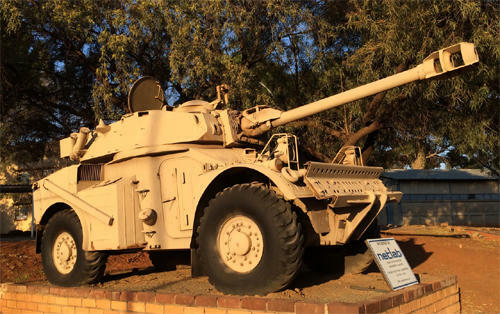 Designed and built by South Africa for long-range reconnaissance, it mounts either a 60mm (2.4 in) breech-loading mortar or a Denel 90mm (3.5 in) gun on a very compact chassis. 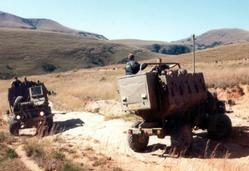 Although lightly armoured, the vehicle's permanent 4X4 drive makes it faster over flat terrain than many tanks. 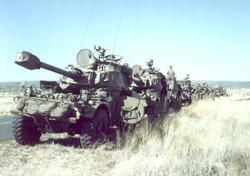 Eland was developed for the South African Defence Force (SADF) in South Africa's first major arms programme since World War II, with prototypes completed in 1963. By 1991, 1,600 examples had been built for home and export; prominent foreign operators included Morocco and Zimbabwe. 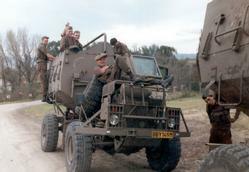 Local overhauls incorporating lessons from internal operations have resulted in a vehicle capable of withstanding the unforgiving Southern African environment and highly mobile operational style of the SADF. Credit to: Noddycannon" by User:Katangais - Own work. Licensed under CC BY 2.5 via Commons. 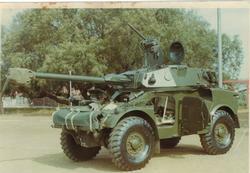 The Eland-20 was a base Ratel's turret atop the Eland chassis. It is fitted with a 7.62mm machine gun and 20mm M963 F2 autocannon offering an elevation of +38° and a depression of -8°. The 20mm cannon has a cyclic rate of fire of 750 rounds per minute. If required, another 7.62mm machine gun can be mounted on the turret roof. 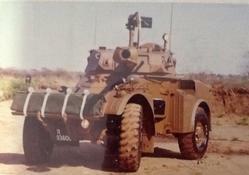 Destined for export, Eland-20s were marketed primarily to Morocco. 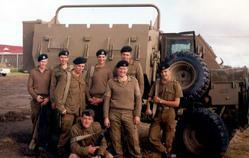 At least 18 of Ireland's AMLs were also upgraded to this standard by South Africa and redesignated "AML H-20". 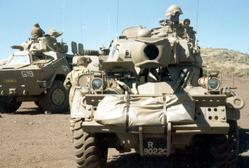 Modelled after Panhard's AML He-60-7, the Eland-60 was the first Eland variant to enter service. It is armed with twin 7.62mm machine guns on the left and a single 60mm mortar on the right. Unlike its French predecessor, only one machine gun is mounted coaxially in the turret. A second was typically carried on a pintle for anti-aircraft use. The mortar has an elevation of +75° and a depression of -11°. A single type of mortar is available: the Hotckiss-Brandt CM60A1, produced under licence as the Model K1. It can be fired on a flat trajectory and is effective up to 300 metres in the direct role, or 1,700 metres in the indirect role. No more than 56 rounds of 60mm and 3,800 rounds of 7.62mm ammunition are carried. 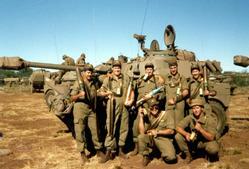 South African crews usually stored 44 mortar bombs per vehicle. Eland-60s have a rounded turret with a large, dual-piece, hatch cover opening front and rear. When needed it could accommodate four ENTAC missiles, two of which slide out of external rails to be launched. 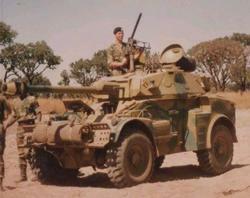 Modelled after Panhard's AML H-90, the Eland-90 functioned as a fire support platform and assault gun. In this role it was easy to underestimate. During combat against tanks, its biggest edge was superior mobility, although this was diminished somewhat by the lack of a stabilised cannon. 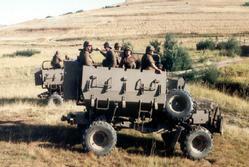 Eland-90s are equipped with a Denel GT-2 90mm gun; a coaxial 7.62mm machine gun is also mounted to the left of the main armament. The GT-2 has an elevation of +15° and a depression of -8°. Turret rotation is manual and takes approximately twenty seconds. A gunner is seated on the right and has a one-piece hatch cover. The loader or commander is on the left of the gun and a single hatch cover provided for the commander. Total ammunition capacity is 29 rounds of 90mm and 2,400 rounds of 7.62mm. When needed, Eland-90s could accommodate two ENTAC or SS.11 missiles, both of which slide out of external rails to be launched.